Our Director and Playground Consultant, Andy Snell, worked with Hillsborough Primary School in Sheffield to create a visually stunning early years outdoor learning environment. 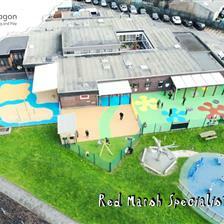 Before our development, the area was a concrete playground with limited opportunities for cross-curricular activities. The space also lacked early years outdoor play equipment that would encourage the children to express themselves, explore their imaginations, work in teams, take safe risks and make errors, decisions and choices as autonomous learners. Due to the entire area being concrete, we needed to make the area safe for play and at the same time, turn the surface into an additional resource for learning. Using our experience in developing early years play environments, we creatively used a mix of our Wet Pour, Playbond and Artificial Grass Surfacing to create a Free Play Area, Journey Zone and Sensory Pathway. To create the Free Play Area, we installed a mixture of Blue and Earth Blend Wet Pour over 73m². The Earth Blend design includes dark grey splashes to further engage children’s imaginations. Teachers can use this area to set up activities or set out resources for further inspiration as children lead the play. We installed a variety of surfacing finishes and speed bumps to create a Sensory Pathway. As children travel along the pathway, the blend of textures offers different sensations, vibrations and noises. The Journey Zone is a visually stunning Wet Pour Pathway which will inspire children to explore and use their gross motor skills either by walking, ruining or riding along on their bikes and trikes. We added parking bays, stepping stones and a grey island roundabout to fuel children's imaginations and develop their understanding of the world. Previously, the area lacked exciting resources for physical development which is a key area of learning for early years children. These exciting physical challenges develop movement and balance, core stability, reaching, stretching and pulling to improve upper and lower body strength, and grab and grasp actions to encourage fine and gross motor skill development. Each one is designed to provide the children with a variety of mental challenges as they plot different ways to get across the course safely. The physical play zone will also create group challenges that require and encourage co-operation, team-work, competition and the use of cognitive skills and imagination. 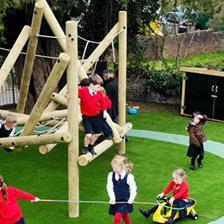 We made the area safe by installing Artificial Grass with a rubber impact underlayer. The children can now take safe risks confidently as the impact layer will protect the children from falls. For further imaginative play, we installed our Giant Playhouse with Walls and a Chalkboard. This is a truly versatile and open-ended resource for child-led play… what will the children turn their playhouse into today? Furthermore, we installed a Planter Bench to connect children with nature and a Giant Sand Box to encourage messy play and fine tune muscle movements through digging and sand manipulation. You can view our entire Imaginative and Creative products range here. 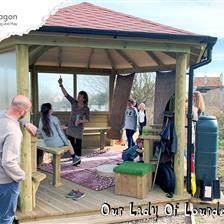 Are you looking for some inspiring new ideas for your early years outdoor learning environment? Arrange a free consultation today by completing our Online Contact Form or call us on 01625 890 330 (North) or 0117 379 0899 (South).